We are one of the widely acclaimed manufacturers and suppliers of Manual Nutsert Tool. The offered manual nutsert tool is made from aluminum, steel and rubber. 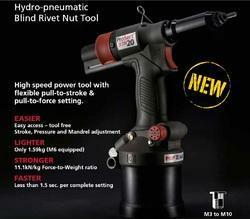 Our supplied manual nutsert tool is easy to operate. The offered manual nutsert tool is acclaimed and liked by the clients, due to longer serviceability and durability. Rivet Diameter: 1/8", 3/16", 5/32"
We are engaged in offering Nutsert Tool.